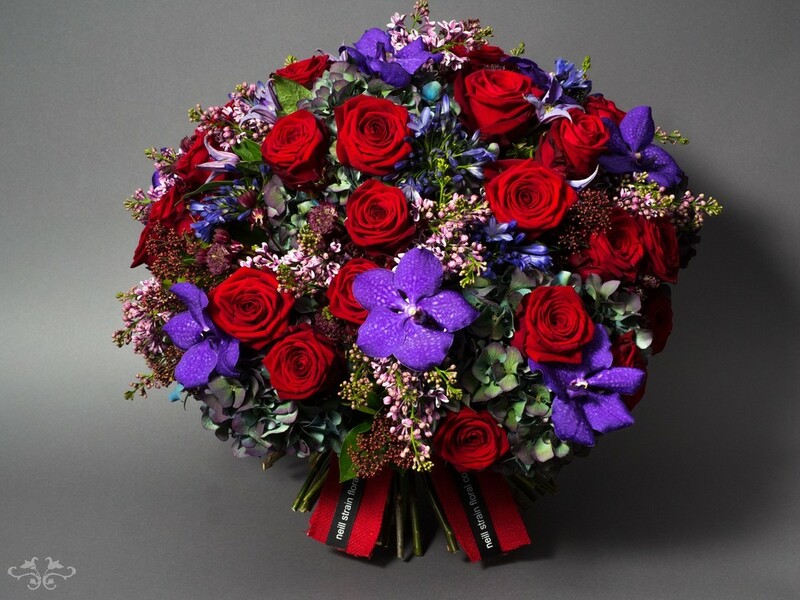 Haute Couture luxury bouquets with stunning Red Naomi red Roses on a bed of pastel Hydrangea for Valentine's Day. 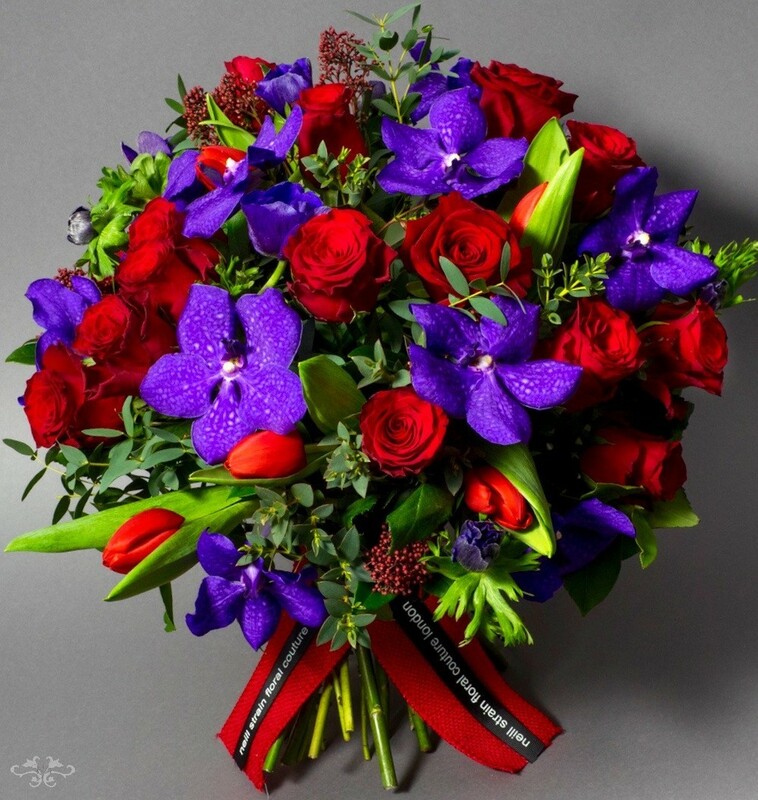 Red Roses and romance are here again. Our giant floral heart is installed in front of the boutique and already couples are queuing up to take their photo in Belgravia's most romantic spot. Lovers and clients gaze through the window looking at our bouquets and designs with our majestic tall Roses and often ask me from where came the inspiration. At our Belgravia boutique, a stone's throw from the fashion centre of the world, we avidly follow the fashions as our "Floral Couture" brand would suggest. For our Valentine's Collection 2016, I was particularly inspired by the floral theme of Dolce&Gabbana's Autumn/Winter 2015 Collection modelled at Milan Fashion Week in a show entitled "Viva La Mamma." Stunning red Rose prints were shaped into elegant frocks celebrating the beauty and femininity of the young "Mamma." The long stems and the large petal count (density) of the Roses on these robes reminds me of the spectacular Red Naomi Roses that we use for our own bouquets and arrangements. The finest red Rose variety on the market today is called Red Naomi, created by the Dutch breeder Schreurs. Renowned growers Porta Nova and Van der Drift produce the highest quality of this exceptional Rose. Hydrangea heads with their tints and tones of lilac, green and turquoise offset the velvety red of our Red Naomi Roses in this bouquet. 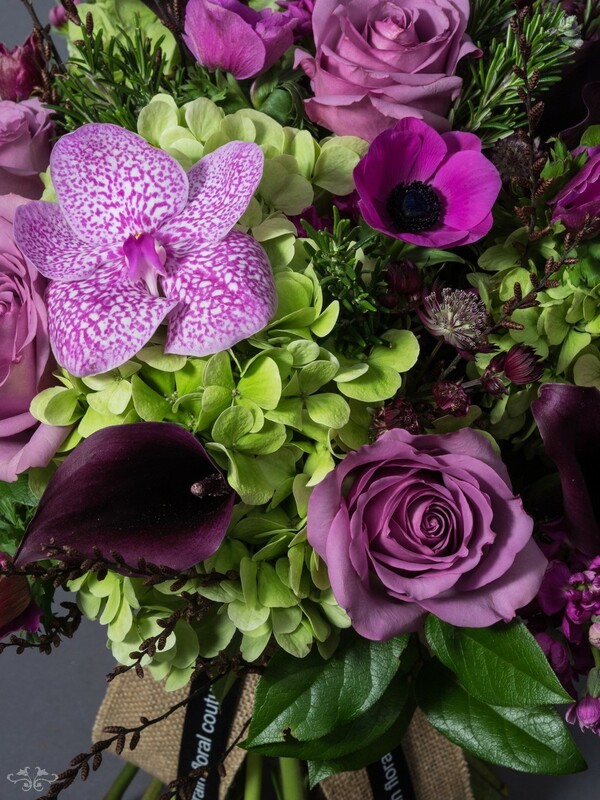 The rich textures and sultry colours of the D&G dresses inspired me to create some hand-tied bouquets with the same luxurious look and the extra pizzazz of striking purple Vanda Orchids. 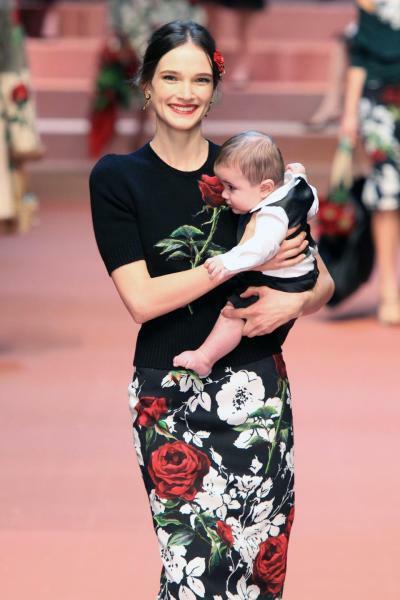 The "Viva La Mamma" catwalk show of D&G included the surprising participation of children and babies, to fully express the beauty of motherhood. 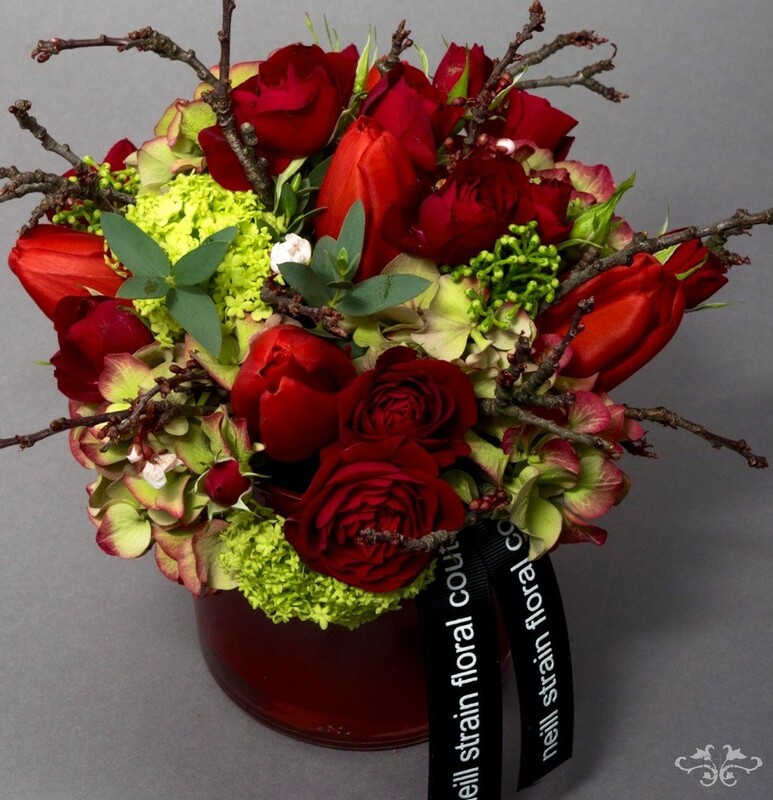 How adorable is that and how exquisite are those single red Roses! We also sell single red Roses at the boutique for Valentine's Day, presented here with a cut-out heart of Birch bark. 80 cm stem of Red Naormi Rose with wired heart and cut-out heart of rustic Birch bark. We also make a discrete collar of Birch bark to frame the Red Naomi Rose heads creating a traditional bouquet with a contemporary twist. Birch bark and twigs add a contemporary look to the magnificent Red Naomi Roses. Some clients look for a beautiful bouquet without red Roses for their Valentine's gift; a subtle pastel colour palette enhanced with our signature Vanda Orchids. And, of course, we always have a wide range of Petite Couture designs, for Valentine's Day or any occasion. All these floral designs are created to inspire our clients. But if you have a very personal message to express to your loved one this Valentine's Day, give us a call or pop into the boutique and let us create something rare and bespoke. No matter how wild or romantic it might be. And don't forget to take your photo in our floral heart!